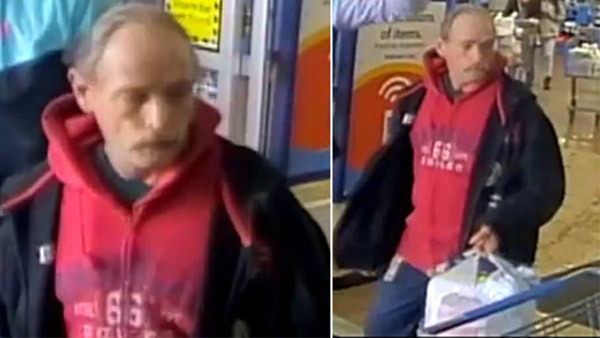 UPPER DEERFIELD TWP., N.J. (WPVI) -- The New Jersey State Police is asking the public's help in identifying a man suspected of shoplifting from a Cumberland County Walmart. It happened around 4 p.m. Sunday, April 15, at the Walmart in Upper Deerfield Township. Police say the suspect was seen placing multiple items in a plastic shopping bag. He was captured on surveillance leaving the store without paying for the items. The suspect is described as a white or Hispanic male, wearing a red hooded sweatshirt, with a black coat. Anyone with information is asked to contact State Police Bridgeton at 856-451-0101.